We had an epic leaf-fall this autumn. Or maybe it just seemed epic because I did nearly all of the raking and bagging myself. 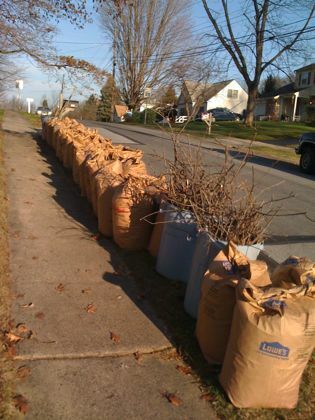 Where we live, yard waste is picked up only eight times a year (four Saturday mornings in the fall, and four Saturday mornings in the spring). That’s it. Anything that isn’t out by the curb on those days has to go out with the regular trash, straight to the landfill. In our backyard, we have a three-bin composter that we built ourselves shortly after we bought this house. Kitchen scraps and yard waste go in there, but it can hold only so much leaf material. So once we fill the bins we rake and bag the rest and send it off to the county’s composting facility. We had a lot of leaves. A lot. This is what our curb looked on four Saturday mornings this fall. Fortunately we got all the leaves up before winter weather arrived. We got our first big snow last weekend, and because it started while we were at my mother-in-law’s place (about three hours away, just north of NYC), we ended up driving home in it. We had clear sailing the first half of our trip, but once the snow started around Newark International Airport (which is always fun to drive past, because the NJ Turnpike runs parallel to the landing runway, and we usually see at least one plane land), we had to slow down considerably. The rest of the way home, the roads were a mess. 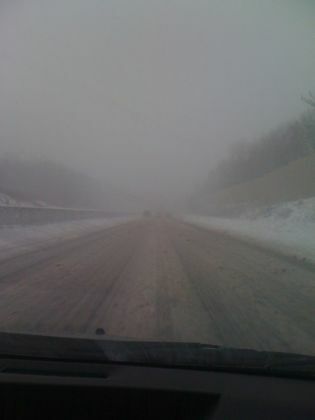 Here’s an iPhone photo snapped through our front windshield as we drove on the PA Turnpike. At some points, the roads were so deserted (and visibility so poor) that we couldn’t see any other cars around us in any direction. We made it home safely, though. Just in time to unload the car and enjoy some homemade hot chocolate! Yikes! Glad you made it home safely. And that’s a really amazing amount of leaves. We (unbelievably) had a similarly harrowing experience on Texas roads this weekend. We had a blizzard. We don’t know what to do with blizzards! I’ll blog about it soon. Terrifying. I’m really glad you are warm and safe at home. Crazy — leaves and roads both! I really can’t imagine: I just went out and got a bathing suit. For indoor laps (resolutions), but still: only in SoCal, right?! @Chris: Believe it or not, we’ll have more leaves to deal with in a month or two, when our neighbor’s 80-foot-tall oak tree finally drops its leaves onto our front yard. @Shannah: My brother went to college in Houston, and I remember him telling me about the time there were snow flurries–the kind of stuff that melted before it even got near the ground–and the city actually officially shut down. @JD: I don’t think I even want to know what the weather is like in your neck of the woods right now. Here, the wind is howling outside and a trip outside to get the mail warrants putting on a winter coat, hat, and mittens!